Advances in Comparative Survey Methodology was co-edited by Beth-Ellen Pennell who recently retired as the Director of the International Survey Operations Division of the Survey Research Center of the Institute for Social Research (ISR) at the University of Michigan. Ms. Pennell has more than 30 years of experience in survey research operations and methods research. She has been with ISR since 1988, first as its Field Director, Director of Data Services and Associate Director of Operations and Planning and for more than 10 years, Director of Survey Research Operations. Pennell also served as the Director of the Data Collection Coordinating Centre for the World Mental Health Survey Initiative, a joint project of the World Health Organization, Harvard University and the University of Michigan. In the position, Ms. Pennell coordinated the technical support and oversaw the implementation of the data collection activities for these general population epidemiological studies in more than 30 countries. Pennell is an elected member of the International Statistical Institute, led the development of the Cross-cultural Survey Guidelines (http://ccsg.isr.umich.edu) and was one of the editors of Survey Methods in Multinational, Multiregional and Multicultural Contexts, edited by J. Harkness, M. Braun, B. Edwards, T. Johnson, L. Lyberg, P. Mohler, B-E. Pennell, & T.W. Smith, John Wiley & Sons, Inc. (2010), which won the 2013 American Association for Public Opinion Research (AAPOR) annual book award for outstanding contributions to survey research methodology. 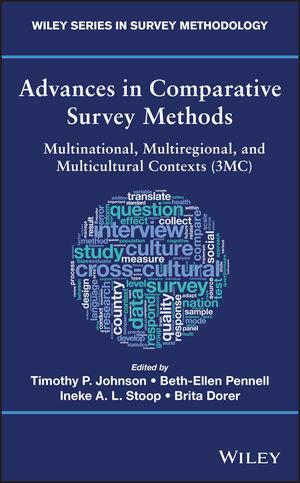 The book is the resulting monograph of the 2nd International Conference on Survey Methods in Multinational, Multiregional and Multicultural Contexts for which Pennell was the conference chair.